Following of the thrills and chills of the first set of Disney Heroes PVC figures, the powers that be released a set of "The Fab Five" (Mickey, Donald, Goofy, Chip & Dale [Chip & Dale take the place of Minnie, the usual 5th in "The Fab Five"]) and a set of Pixar characters (Woody, Buzz, Mr. Incredible, Syndrome, Sully & Randall). These are cute, but it's really the fourth set in the series that speaks to us collectors again. This set is based on film franchise Pirates of the Caribbean. 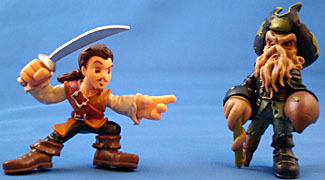 Disney again takes its cue from the popular Hasbro Heroes imprint and offers up stylized interpretations of some of the major characters from the films and its surrounding mythos. 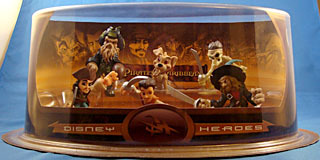 Included here are: Jack Sparrow, Will Turner, Captain Barbossa, Davy Jones, the Prison Dog, and a Pirate Skeleton. 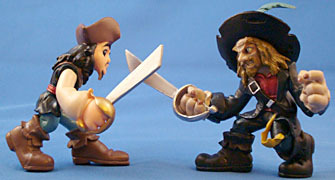 The sculpting is just fine, as plain as the Hasbro style in most places, but will a bit more "detail" on the clothes and texture on Barbossa and Jones. One will also note that the figures also have individualized expressions, as opposed to the omnipresent drug-riddled look of doe-y eyed glee most Hasbro figures of this nature. In addition, the coloring of Barbossa implies, and the art on the packaging backdrop confirms, this set takes its inspiration from the so-much-of-a-failure-it-never-even-aired animated Pirates of the Caribbean show. While one would certainly prefer more live-action inspired figures, ultimately this style is so animated in its aesthetics it really makes no difference. Articulation is non-existent, which isn't unheard of in this format, but definitely appreciated. There separate pieces to each figure, but they're just glued together rather than a nice swivel or ball-and-socket which is disappointing, but not a deal breaker. Fortunately they all stand, or sit (sit, ubu, sit! ), pretty evenly. 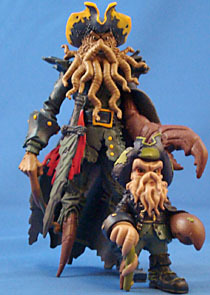 Davy Jones can be a little wobbly, but that's what every Davy Jones collectible has bred us to expect. The paint is certainly nothing to write home about as it juggles between okay and bad. 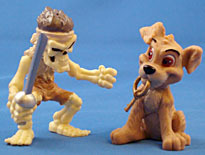 There are several bad edges, like the Skeleton's shorts or Jack's goatee upon whose paint ends at the sides leaving the back flesh colored, but for the most part its fine for this style, though. The figures rely on colored plastic more than I like, which leads to a "cheap" look predominantly in the shiny flesh tones and the Skeleton's limbs (though that could also be the result of his clothing being of like tones). In general, I like this set more that the first set, the one based on classic Disney characters. It has better sculpting and more interesting designs. These figures also fit in with the Hasbro style better, I feel, though I do like the look and brighter colors of the other set. These six figure packs run for $13 at the theme parks, which is a steal considering it costs $7 for two Hasbro Heroes. Looking at it in those terms, I can easily forgive any of my other grievances. This a fun set and I definitely hope to see more Pirates of the Caribbean sets in the future!